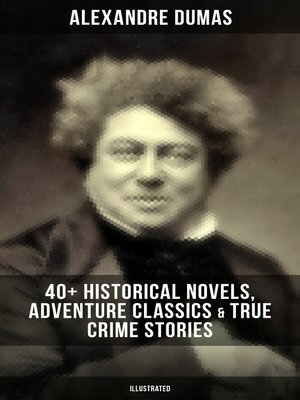 This unique collection of Alexandre Dumas' historical novels, adventure classics & true crime stories has been designed and formatted to the highest digital standards. The D'Artagnan Romances The Three Musketeers Twenty Years After The Vicomte of Bragelonne Ten Years Later Louise da la Valliere The Man in the Iron Mask The Valois Trilogy Queen Margot (Marguerite de Valois) Chicot de Jester: La Dame de Monsoreau The Forty-Five Guardsmen The Memoirs of a Physician - Marie Antoinette Series Joseph Balsamo: The Magician The Mesmerist's Victim: Andrea de Taverney The Queen's Necklace Taking the Bastile: Ange Pitou The Countess de Charny: The Execution of King Louis XVI Other Novels The Count of Monte Cristo The Conspirators: The Chevalier d'Harmental The Regent's Daughter The Hero of the People The Royal Life-Guard Captain Paul The Sicilian Bandit The Corsican Brothers The Companions of Jehu The Wolf Leader The Black Tulip The Last Vendee The Prussian Terror Short Stories A Masked Ball Solange Celebrated crimes The Borgias The Cenci Massacres of the South Mary Stuart Karl-Ludwig Sand Urbain Grandier Nisida Derues La Constantin Joan of Naples The Man in the Iron Mask (An Essay) Martin Guerre Ali Pacha The Countess De Saint-Geran Murat The Marquise De Brinvilliers Vaninka The Marquise De Ganges Essays Alexandre Dumas by W. E. Henley A Gossip on a Novel of Dumas's by Robert Louis Stevenson Alexandre Dumas by Andrew Lang To Alexandre Dumas by Andrew Lang Biography Alexandre Dumas by Adolphe Cohn Alexandre Dumas, père (1802-1870) was a French writer whose works have been translated into nearly 100 languages and he is one of the most widely read French authors. His most famous works are The Count of Monte Cristo and The Three Musketeers.